Silicon Valley-based serial entrepreneur and angel investor Rakesh Mathur is in and out of India once every three months to tend to two young start-ups—Vegayan Systems and Webaroo Inc. 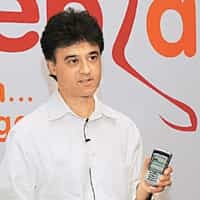 While Webaroo is a mobile value-added services start-up that Mathur has co-founded, telecom networking solution start-up Vegayan is a pure angel investment. Both Webaroo and Vegayan were incubated on campus at IIT. Was that a prerequisite when you decided to invest here? Not really. I’ve actually been involved with IIT’s incubator, SINE (Society for Innovation and Entrepreneurship) since 2000, when Prof. D.B. Pathak and I conceived the model. When I wanted to do Webaroo, in 2004, I decided to come back to campus. Both Webaroo and Vegayan started at SINE. My friend Hiroo Bijlani, who has been a management consultant in India for many years, suggested I also look at Vegayan and I met Girish Saraph (founder of Vegayan) at SINE and we hit it off. You are an investor in one and a co-founder in the other. What does that imply in terms of role playing? My primary full-time responsibility is for Webaroo. I’m involved with operations, product development, all of it. With Vegayan, there are a couple of ways I would help. For instance, as it goes through pilot projects in India and begins to move into markets overseas, strategic partnerships will become important. The other aspect that is super important for Vegayan now is recruiting. Most venture capitalists (VCs) don’t invest in Indian product companies yet. What’s your view? A lot of good VCs, in fact, are coming to India right now. I think, there’s so much opportunity still left in the services space that the deals that many VCs see and which are relatively lower risk are services companies. And VCs also need to deploy a lot more than a few hundred thousand dollars. If you have a $250 million (Rs985 crore) fund and three partners, each partner has to invest $80 million. It is hard to do that in small increments. But you think product has potential in India? I’m on the board of a public company called Geodesic—and that has potential in the product space. The answer is yes, it is starting to happen. I believe in the area of mobile telephony and networking. India has very impressive installations and the need for so much bandwidth, because of the mobile phone explosion, that any solution in the networking space and applications in the mobile space are interesting.